The times have changed. We need a fresh understanding of the meaning of success. What do Condoleezza Rice, Joe Torre, Bill Gates, Goldie Hawn, Mary Hart, Garry Kasparov, and Jack Welch have in common? All have talked at length with Maria Bartiromo about business, the world and their surprising, inspiring and uncommon ideas about the meaning of success. 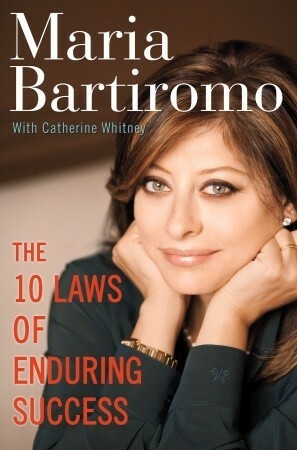 Their stories, those of an extraordinary range of other people from all walks of life, and Maria Bartiromo’s personal insights are the foundation of The 10 Laws of Enduring Success. It is the guide for the extraordinary times we are living through. During bullish, optimistic periods, people seem to ride an upward wave with ease and confidence. The tangible evidence is right there for all to see–in their jobs, bank accounts, homes, families, and the admiration of their peers. But it is a fact of life that success, once earned, is not necessarily there to stay. If ever there was a cautionary tale about the fleeting nature of success, it is the events of recent years. long been ignored: about what’s really important to them, and where the bedrock of their personal achievement lies. As Maria Bartiromo watched the financial drama from her front-row seat at the New York Stock Exchange, she began to re-assess the meaning of success–not just as one-off achievements, but as a durable, lifelong pursuit. Is there, she wondered, a definition of success that you can have permanently–in spite of the turmoil in your life, your job, or your bank account? This question is more important than ever, given the unpredictability of the current economy. –What are the intangibles that can’t be measured or counted? –What are the qualities that aren’t reflected in your title or on your business card? –And more practically, how can you remain successful even when the worst things happen to you? –Is it possible to build success from failure? It’s lonely at the bottom of the heap, when your BlackBerry stops buzzing, and the world moves on without you. Everyone wants to be close to success, and to have success. But what is success? How do you get it, and how do you keep it? As Maria interviewed some of the most successful people in the world, she felt the need to answer these questions: what makes these success stories tick? How did they achieve such leadership and power and how can one hold onto it, once you get it. What are the barriers to success and what is the bedrock to enduring success?